A picturesque harbour, colourful Italianate houses, a rugged mountainous spine, a crusader castle presiding over an abandoned village, a tiny, remote monastery, and a scattering of beaches. Halki may be one of the smallest inhabited islands in Greece, but this tranquil place is bursting with personality and full of Greek charm and hospitality. Part of the Dodecanese archipelago, Halki sits just six kilometres west of Rhodes, yet its character and ambiance are a world apart. Recognised by UNESCO as the ‘Island of Peace and Friendship’, walking off the ferry at the island’s port and only town, Emborio, is like stepping into a bygone era. There are few vehicles here, only the gentle chugging of fishing boats returning with their day’s catch to the crystal-clear harbour waters. On land, fishermen sit in the shade of trees while preparing fish and seafood, next to men sipping ouzo and playing backgammon. This laid-back pace of life coupled with the warmth of the locals make this the perfect destination if you want to get away from it all. Measuring just 28 sq. 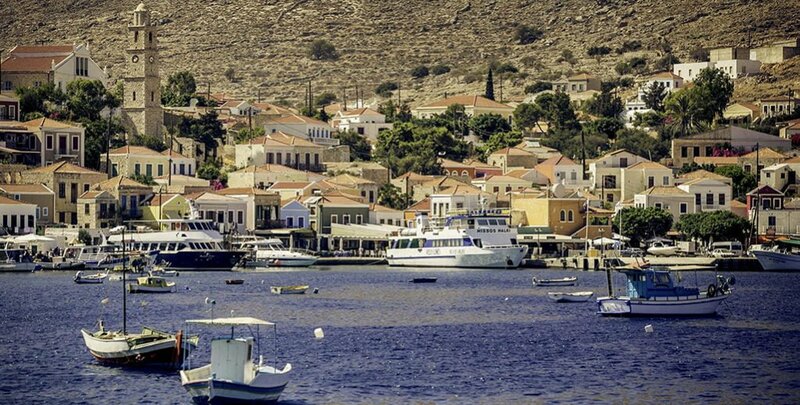 km, tiny Halki offers an alluring first impression. Restored neoclassical villas bathed in Mediterranean hues line the horseshoe-shaped harbour, rising up like an amphitheatre. The silent clock tower and ornate spire of the town’s main church, St Nicholas, rise above the rooftops, while three sail-less windmills peer down from the mountainous backdrop. The island’s main hub and home to our accommodation, Emborio is a magical place. Wander through flower-lined alleyways, past grand villas and tumbledown mansions, enjoying the delicious smells of home cooking wafting from the windows; pull up a chair in one of the tavernas or cafes to feast on local fare, such as Halki’s famed pasta dish; explore the Church of St Nicholas, patron saint of the island; or slip into the shimmering waters to swim amongst the fishing boats. Venture away from Emborio, and you’ll find plenty to entertain you. The abandoned town of Chorio, once the island’s largest settlement, invites exploration of its crumbling houses – if you’re feeling active, climb up to Kastro, the crusader castle that presides over the tumbledown town, to wander amongst the impressive walls and explore its churches. There are a number of churches and monasteries dotted around Halki’s mountainous interior. Two of the most impressive are the Monastery of Panormitis with its star-studded vaulted roof, situated on the opposite side of the valley to Chorio, and the distant Monastery of St John at the far end of the island, with its beautiful icons and shaded courtyard. If you’re a sun worshipper, Halki boasts a scattering of beaches around its rocky shoreline, perfect for tranquil days swimming and sunbathing. Most are accessible on foot, including the sandy beach at Pondamos, which has a popular taverna, as well as sunbeds and umbrellas for hire. Hikers love rambling along the island’s rocky paths, where they’re richly rewarded with dramatic natural scenery and unforgettable views – popular walks include Chorio, Kastro, and the long walk to the Monastery of St John. The nearby island of Alimia makes for an interesting day’s excursion, with its medieval castle and clear, calm waters. And if you’re a keen artist, our painting holidays at the start of May offer the perfect combination of creativity and relaxation. As dedicated specialists for holidays to Halki, Nissia offers a selection of villas in Emborio, many in prime waterfront locations. Our island representatives, Meni, ably assisted by Steve and Blendi, have intimate knowledge of Halki and an infectious love for the island. They will meet you at the airport, accompany you on your transfers between Rhodes and Halki, and are always on hand to answer any problems or queries. For unrivalled personal service, choose Nissia Holidays for your holiday to Halki. Discover more about this fascinating island in our Ultimate Guide to Halki. For accommodation options, see our Halki accommodation page. To enquire about a holiday to Halki or to make a booking, contact Nissia Holidays on 01455 289421 or email us: info@nissiaholidays.com.